"We are proud of our association with Family Action which produced a range of leaflets that have already helped hundreds of pupils get the best from their school experience, The leaflets will also be an enduring legacy for schools to use to support more families in years to come. We thank Family Action for helping us deliver a little part of our shared vision of a better life for vulnerable families." 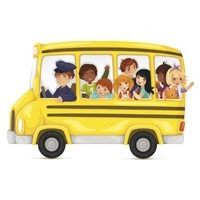 Between 2013-2015 Family Action partnered with the National Association of Head Teachers (NAHT) to deliver the Ready to Learn Everyday campaign, jointly creating 10 leaflets aimed at School children to aid them in their everyday learning and home lives. The partnership raised nearly £12000 and introduced Family Action to 300 schools – with one choosing us as their Charity of the Year, raising £5000. So a big thank you so much to all of you who took part. You can use our leaflets by downloading them below. 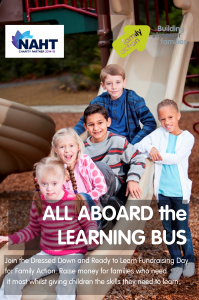 You can also download our FREE Assembly Pack and Presentation ‘All Aboard the Learning Bus’. 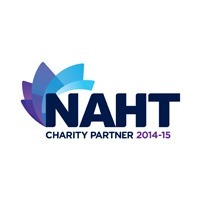 Choose us as your Charity of the Year! Your school can still support Family Action, by choosing us as your Charity of the Year. The ways to get involved are vast and varied and a lot of fun! See the schools section of our fundraising page for lots of ideas. We also have a Dressed Down and Ready To Learn pack with hints and tips.